Aaah, the breakfast burrito: that magical combination of eggs, maybe some meat, probably some potato, and likely some sort of sauce, all wrapped in -- we're guessing -- a tortilla. It sounds... simple? Sure. But there's a big difference between a hey-that's-fine breakfast burrito and a HOLY-MOLY breakfast burrito. 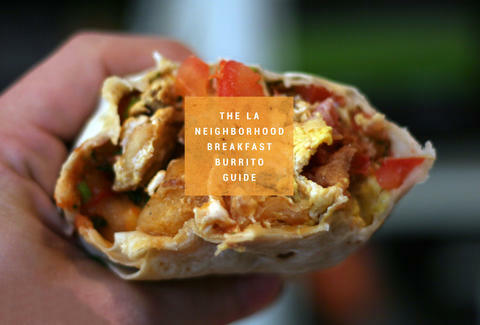 To help make finding the latter a little bit easier, here are the best breakfast burritos in NINETEEN different neighborhoods spread all across LA. 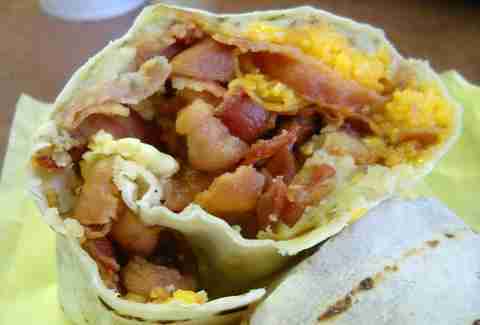 When we last wrote about breakfast burritos, our commenters were up in arms that we didn't include the Corner Cottage. Like, seriously insanely upset. So we corrected it. It's the only time we've ever done that, ever. That should tell you just how good this cult favorite is. Here's the thing about hitting this Grand Central Market staple: if you go with a few friends, you can also get Wexler's smoked meats and EggSlut's breakfast sandwiches, and bam -- you've hit three of the best breakfast options in all of LA. A few years ago this diner got revamped, but the killer breakfast consistency remains, including their burrito, which is ante'd up with black beans and a green tomatillo sauce. Is it surprising that a former waitress from Jinky's (also on this list!) opened a breakfast-themed restaurant that's always busy? No, it is not, nor is it a surprise that their burrito is bomb. OK, stay with us: we know Taqueria El Tapatio is here, and yes it is majestic. 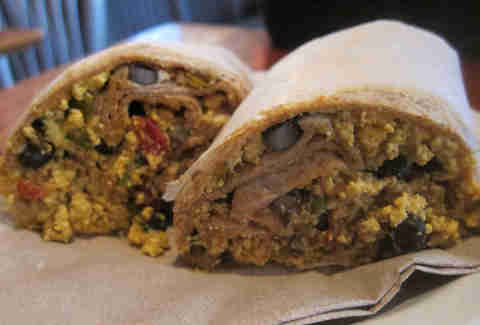 But DaJuiceBar has two things in its burrito that set it apart (other than that dumb name): mashed potatoes and kimchi. 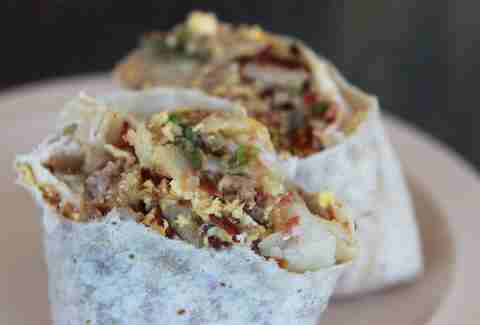 Yep, kimchi breakfast burritos are a thing. And you're gonna want one. There's an Amigos in Hermosa, too, but if we didn't mention Brother's, a horde of beach bros would be all "Bro, why didn't you mention Brother's?". Under the watchful eye of the Church of Scientology, this always-creative, patio-driven cafe fires off a cheddar- and cilantro- and sour cream-topped burrito that's stuffed with the usual suspects and -- oh yeah -- cactus. FTW. 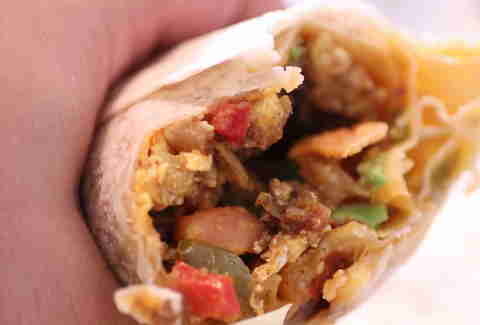 What sets this neighborhood staple's burrito -- stuffed, like most, with eggs, potatoes, and your choice of meat -- apart? Three words: open. 24. Hours. This f'real taqueria's got f'real ingredients in their burrito: peppers, beans, onions, tomatoes, cheese, and the simmered-and-shredded meat known as machaca. 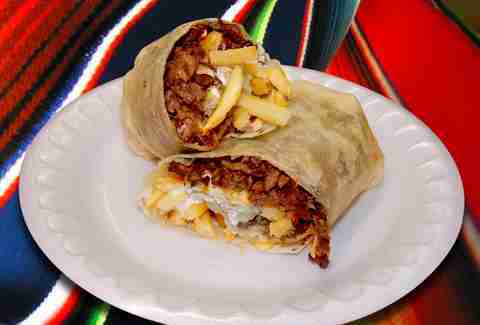 Long Beach may be the breakfast burrito capital of LA and Taqueria La Mexicana may be the governor. Why does this window reign supreme? Uh, because they generously substitute in-the-burrito hash browns with FRENCH FRIES. Yep. This Anthony Bourdain favorite will appear on every list of the best breakfast burritos from here 'til eternity. Which is as it should be (also, we have it on good authority that the chilaquiles burrito is EVEN BETTER. Impossible? Maybe??). This hole-in-the-wall knocks out South Bay breakfast deliciousness with their two-egg burrito, which you can get stuffed with ham, hash browns, sausage, AND bacon -- all topped with a killer habanero salsa. This newcomer tortilla monster -- served out of a teeny-tiny storefront on Fairfax -- has rapidly become massively coveted, and for good reason: the dudes behind Bludso's smoke the burrito's potatoes in the very same smoker that they use for brisket and chicken, both making them extra flavorful and extra crispy. Bonus: the salsa verde. Just... the salsa verde. Is it the burrito nazi who yells at you, the oppressively long lines, or the perfectly cooked bacon that make this one of the best breakfast burritos in LA? Yes, it is all of those -- and the size of this monstrosity, which, for many people, could count for two or three meals. And for you, one. Perhaps the schmanciest, brunchiest place on this list, Huckleberry is a longtime favorite of soccer Moms and soon-to-be-soccer Moms. So is that a reason to write it off? 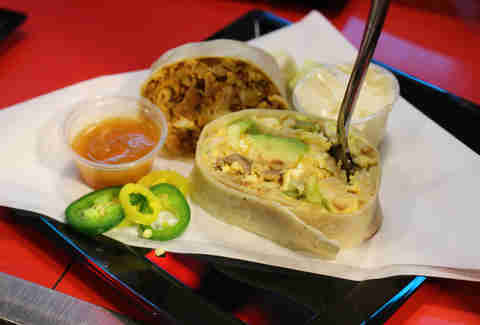 Hell no: in their tortilla-wrapped bomb there are fried potatoes, Niman Ranch bacon, and guacamole. Mom wins. For the next time you're in Mid-Valley and thinking "yo, where's the best breakfast burrito by me?? ", we gotcha: Jinky's will hit you with the realness -- their Desperado's not only named after the best Eagles song, but it's stuffed with eggs, red onions, diced tomatoes, Ortega chiles, cheddar cheese (*breath*), chopped potatoes, and Jody Maroni turkey-chicken chorizo, and then (yes, there's an "and then"!) served with pea guacamole. And, oh yeah, you can sub the chorizo for gourmet chili. Or do both (do both). Would you like super thick-cut bacon? Would you like it with homemade, fire-roasted salsa? Would you like it wrapped in a tomato-basil tortilla? You would. And you would go to Home for it. This super-charming cafe hits your burrito with high-end tri-tip, steak-ing its claim above the competition. Obviously you're gonna want to add meat to this breakfast staple's number, but it's actually already super flavorful thanks to a sautéed combo of peppers, onions, tomatoes, and cilantro. Jeff Miller is Thrillist LA's Senior City Editor and is seriously obsessed with the Cofax burrito. Like, to an alarming degree. Like, he's probably eating one right now. Talk about it with him on Twitter at @thrillistla and see pictures of it on Instagram at @jeffmillerla.